I don’t think I’ll ever go back to oven pizza. 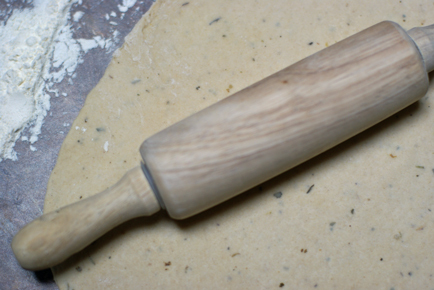 Roll the dough out on a clean and floured surface. 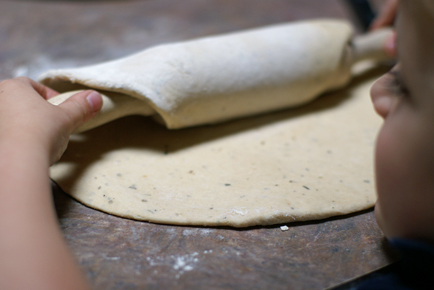 Roll as if you were making a thin crust pizza. 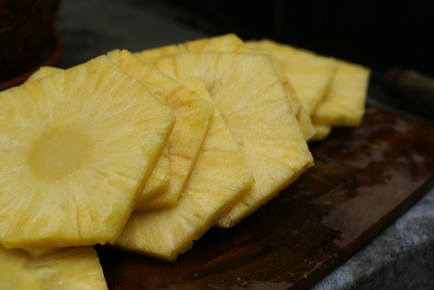 Slice a fresh pineapple into 1/4″ or thinner slices. Try not to eat them straight off the grill. Because if you do, you’ll burn your tongue. But if you wait a few minutes for the slices to cool, they make for a succulent appetizer. (Once cooled, tear or cut the pineapple away from the center core. Slice into bite size pieces to throw on top of the pizza. 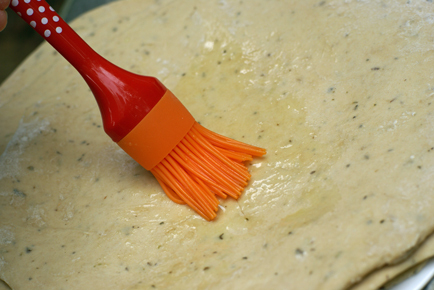 Brush olive oil onto one side of the dough. 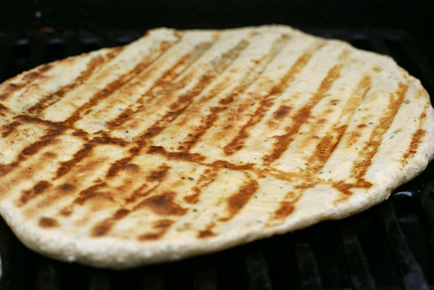 Place on the grill and then brush olive oil over that side. Dough will bubble after a few minutes. Turn down the heat at this point. 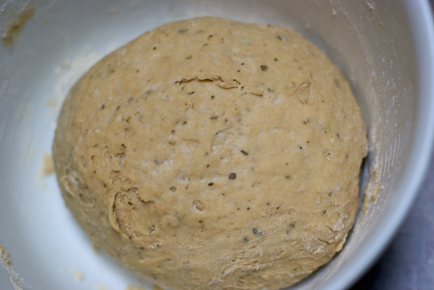 Once the edges of the dough have cooked through, then flip and start loading it up. Spread some pizza sauce over the top. 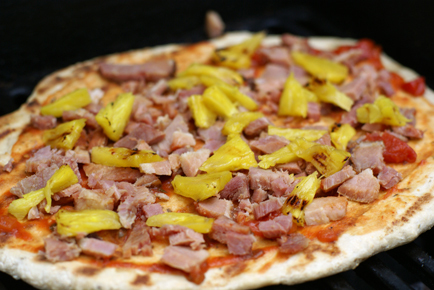 Then add the cooked and diced ham, and bits of the grilled pineapple. Top with shredded mozzarella cheese. Turn off the grill and cover for about 5 minutes, allowing the cheese to melt. This is all we had for dinner. The boys and I ate this pizza without cheese. And quite honestly, it didn’t need it! Quite amazing without the cheese. And I’m telling you. I’m never going back to oven pizza. 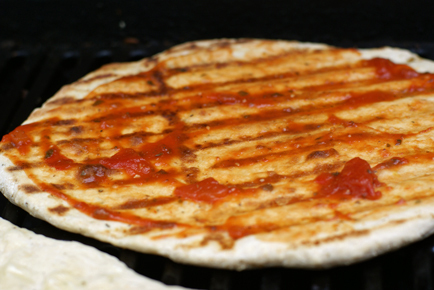 We love grilled pizza, too! I’ve even had success with grilling frozen pizza. We rarely buy it b/c my DH makes an awesome crust. For those rare occasions, however, grilling it really makes the frozen pizza taste like something a little more special. YUM!!! Hawaiian is my fave and I have a pineapple ripening right now. gonna have to try when it’s 90 this weekend! Oh. My. Lanta. This looks too DIE for! 1. 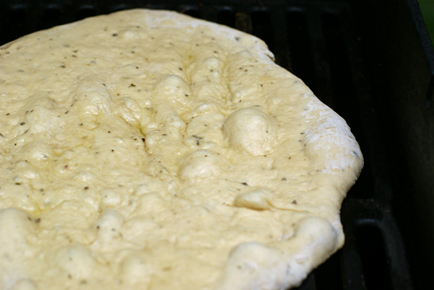 So, regular old pizza dough (homemade, rolled from a can, whatever) will work on a grill? I mean, it doesn’t stick, doesn’t fall through the slats and get all gloppy on the underneath part of your grill, cooks through, etc.? I’ve seen special stones and such you can buy for grilling pizza, but never seen it done straight on the grill surface. It was to die for! I’m not sure about the refrigerated dough. You’d definitely want to brush it…you might try rolling it out and laying it on a greased surface and flash freezing it for 10 minutes or so, so it’s nice and cool (and not droopy!) when you set it on the grill. And yes, my oldest has a dairy allergy. I suspect the same for my middle guy, but have never had him tested…and I omit it because I’m breastfeeding and am not ready to find out if Tyler has an allergy! Try it with some fresh tomato’s and some black olives…. Even can do chicken and bbq sauce…. Yummy!! That’s why I love your recipes and they are so easy to tweak! My daughter is also allergic to milk! We have the black bean coconut brownies in the oven right now. Thank you for your recipes! If you can, when you make something with dairy, please let us know what you do for your son to eat. I spend a lot of time tweaking recipes and then trying to make one of the batches without “milk” for my daughter so we all eat the same thing. Hawaiian Pizza is my absolute fav! I am the only one in the family that likes it though so I don’t make it often. I have never tried it on the grill though… I may have to do that! That looks so yummy! I really need to try grilling my pizza crusts. 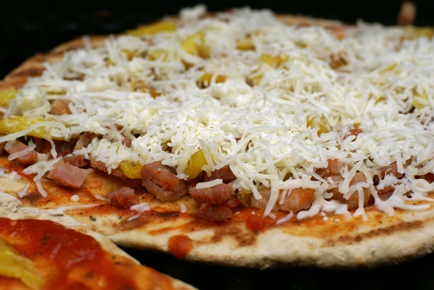 I love Hawaiian Pizza, but never tried it on the grill. I’m gonna have to try it! This would make an excellent recipe to link up to my On the Grill blog party this week. Here is the link if you would like to do so! I’d love it if you did! Can’t wait to meet you at the Savvy Blogging Summit! This makes me SO hungry. I was thinking about getting a TJ pizza dough today anyway and now I know what to do with it. Thanks so much for all your great recipes. This one looks great. I’m looking forward to trying it. I’ve never heard of grilled pizza. I’m a little concerned about it falling through, but I’ll try the flash freezing first. The grill is genius! 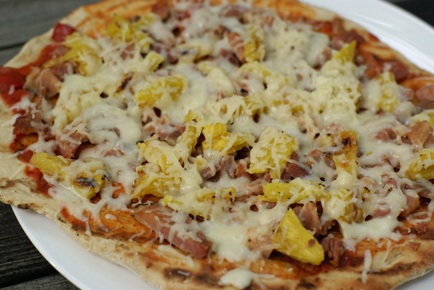 This pizza already looks flavorful, but I really like the idea of grilled pineapple. It adds special flavor, and makes a fun outdoor activity. I do frozen for convenience since I don’t want to cook. its usually about 6 (for one pizza alone!) which I don’t understand…but its definitely something interesting to ponder! plus its fun for date night! I love homemade pizza on the grill, just started this last month. Making hawaiian, pepperoni and pepperoni/mushroom for my family tonight. 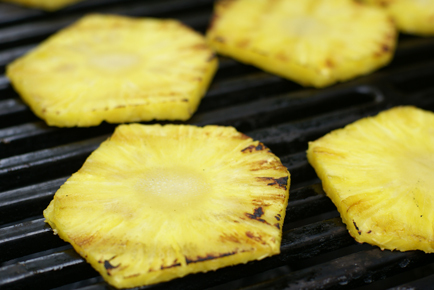 Also trying your grilled pineapple slices tonight too. Thanks for the idea. 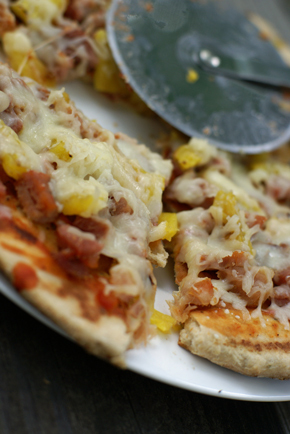 I made four individual pizzas – two had diced chicken / bacon pieces and two had diced chicken / pineapple. I used a box mix for the crust and my fiance thought that the crust tasted flour-y… If I can figure out how to get rid of the flour taste, this will become a favorite in our house. I haven’t figured out the cost…but the bacon was part of our Christmas present and I used coupons for the sauce, chicken and pineapple. This is the best. I did it and it does NOT fall through the grill at all. The crust is perfection! Just a note, grilled pineapple is awesome (fresh or canned rings) on vanilla ice cream with caramel sauce. It is serious birthday material. The ony thing I can add is a sweet bbq sauce instea of the pizza sauce. A restauant near me fixes i this way and it is sooooo good.